There is something to be said for serendipity. 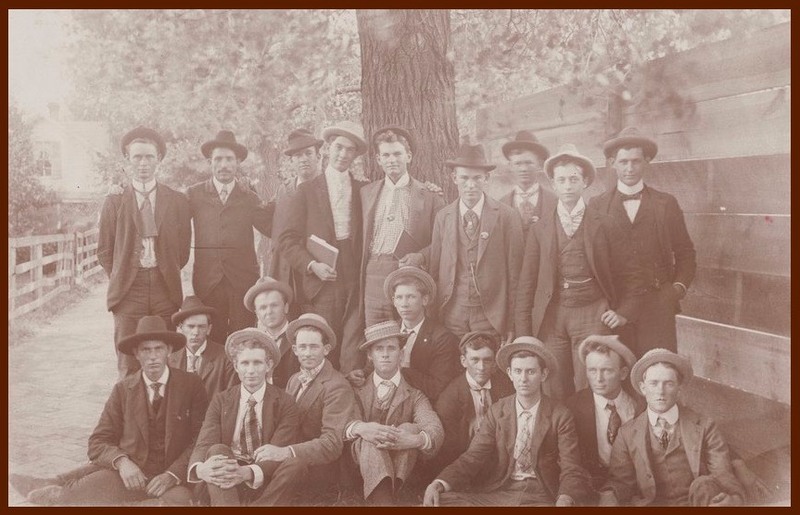 While searching for information on Francis McDonald, the young man who replaced Stephen Lovewell as Sinclair Township's “road boss” along the Atchison Topeka & Santa Fe, I found a group photo of a few students from Francis’s alma mater, Wesleyan Business College, on Kansasmemory.org. While one of the scholars does resemble Francis, only one member of the group has been paired with a name. The third man from the left seated on the front row, the one wearing a straw boater that seems to have been sprung from its perch by a mass of unruly curls, is identified as one Arley Meek. Although genealogical sleuthing turned up little on Mr. Meek, a search of newspaper archives uncovered the mother lode, dozens of blurbs from small-town papers in widely-separated Kansas communities, concerning the misadventures of what I took to be at least three men named Arley Meek. Turns out, I was wrong. It took only a few minutes of cross-checking to determine that the 137 items culled from newspapers printed in Courtland, Salina, Mulvane and other towns all refer to the same person, one whose day-to-day life between 1903 and 1916 is summarized by a string of news notes detailing the various mundane doings and remarkable mishaps that befell one extremely unlucky young man. Some of the earliest mentions of Thomas Arley Meek are simple hometown happenings from the White Rock area, accounts of hauling wood from the creek, assisting one of his neighbors at shucking corn, or helping another put up hay. As early as 1903 both he and his brother Frank also talked about seeking higher education someday. Hired to help at the Courtland depot, he began studying telegraphy on his own. Also in 1903 came the first indication that Arley might be accident-prone, when his buggy was smashed in a runaway accident, though Arley himself was not harmed. He tried to repair the buggy and did give it a fresh coat a paint, before deciding to buy a new model. In 1905 the Courtland Journal devoted a short paragraph to the manifold miseries of a single evening. Arley Meek met with a series of accidents Thursday night of last week. He started out with a sleigh, a horse, and a violin, dropped his horse off one end of a bridge while he fell off the other and broke a majority of the commandments before he succeeded in getting back home. Don’t let Arley know who told you. Enrolling in Skelton’s School of Telegraphy and Railway Business in Salina in 1906, an institution which would soon be folded into Wesleyan College of Business, Arley must have posed with his classmates for the photograph shown above. A misunderstanding on his very first night in the big city earned him a lengthy write-up in the Salina Journal. How a New Boarder Disturbed a Neighborhood. There was all kinds of excitement at the boarding house at 129 South Seventh street at an early hour this morning and as a result everyone who sleeps there is tired and ‘dopey’ today. It all came about by the appearance of a new boarder yesterday who was not accustomed to city life. Arley Meek, a young man who lives at Courtland, came here yesterday to attend the school of telegraphy, and went to the South Seventh street place to board. At 3 o’clock this morning he heard the town clock strike, and thinking it was the fire bell he rushed to the window to make an investigation. While looking out a cab passed by and the young man was certain it was the fire department. He aroused the household and all the boarders, and they rushed pell mell down the street for several blocks in the direction the cab had gone, led by the new boarder. When it was learned that there was no fire and that the disturbance had been caused by the striking of the town clock and the passing of a cab there came near being trouble. It was more than an hour before the boarding house was again a scene of quite and peace. I have not learned whether Arley became proficient at the telegraph key, but he was back on the farm by 1908 when he was kicked by a horse, an incident that required a doctor’s visit. Kicked a second time two years later Arley was described as “badly crippled up,” at least for a time. He moved to Osage County, living first at Olivet and then on a farm near Melvern, where he married Mamie Spring in 1912. Divorce papers were filed the following year. Despairing of finding true love on his own, Arley joined a bachelors’ club at the local YMCA. Members published their descriptions and solicited correspondence from eligible young women. Although fully a quarter of the letters received by club members were addressed to Arley, it later transpired that someone had rigged the outcome, leading to further publicity after the following story reached the desk of the Topeka Daily Capital. Arley Meeks, of the Bachelors’ Club, Victim of Joke, Think Kansas City Police. A good looking young man of 30, representing himself as Arley Meeks, a member of the Melvern, Kan., Bachelors’ club, appeared in police headquarters early this morning and inquired the whereabout of a Miss Jane Crew with whom he had been corresponding and who gave her address at 803 North Sixth street, which is the number of the city hall. Meeks told the police that he had been writing to Miss Jane Crew of this city ever since she had read his description in the paper, and that thinking she was in earnest, he had come to this city meaning business. The police strongly suspect one of the young ladies in the city hall as being the mysterious “Miss Crew,” and are working upon a clew in that direction which they refuse to divulge at present. A few months before the embarrassing details were published, there had been another runaway accident with Arley at the reins, one which resulted in facial cuts and bruises to Arley’s younger brother Harry, but no serious injury to either man. Arley’s divorce became final in March, when the search for a suitable match could intensify. Not that Arley was lonely, since he shared a house at Melvern with his widowed mother Anna, brothers Harry and Donald, and sisters Dollie and Birdie. Perhaps that was it. He needed a place of his own where he could have some privacy. He did move to a small farm where a young lady name Charlotta paid a short visit, but though his friends believed they could already hear the "faint tinkle of wedding bells," domestic bliss was not immediately in the cards for Arley Meek. Instead, the most memorable event of 1916 happened when Arley’s horse wandered onto the railroad track and was killed by a train. On the other hand, looking at the picture at the top of this page one more time, my identification of Arley as the curly-haired man depends on a loose definition of “front row.” The person who submitted the photograph to Kansas Memory may have meant the chap with high forehead and front-facing ears who has his hand on the curly-haired man’s arm. Somehow, I can see either fellow as a member of the Osage County Bachelor’s Club. Maybe it’s the hats.